If you’ve heard the old Glen Miller song, you know that if you dial PEnnsylvania 6-5000, you’ll reach New York’s Hotel Pennsylvania. From December 1930 until the mid 1960s, all telephone numbers in New York consisted of two letters and five numbers (known as 2L-5N numbering). Prior to 1930, New York had a 3L-4N numbering system. What do the letters mean? The initial letters were often named after the street where the local central office was located, explains a write to one website focusing on old exchange names. AT&T tried to standardize the words used for initial letters to decrease confusion, and published a list of officially recommended EXchange names. Starting in 1961, New York Telephone introduced "selected-letter" exchanges, in which the two letters did not mark the start of any particular name, says Wikipedia. By 1965, any new phone numbers were only numbers. Pre-existing numbers continued to be displayed the old way in many places well into the 1970s. 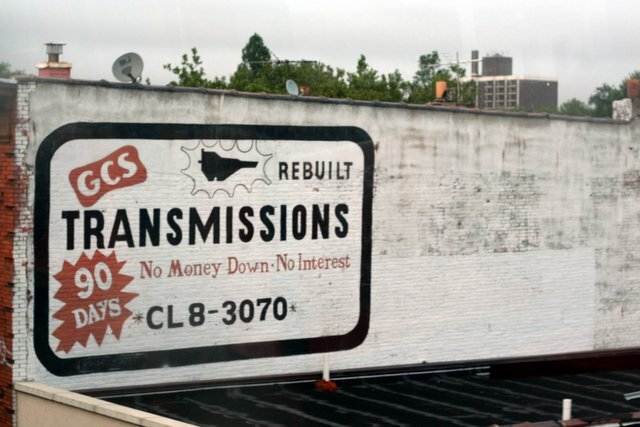 Amazingly, the transition to "all-number calling" (ANC) in the U. S. took almost thirty years, up to around 1980 depending on the region, says Ted Byfield, author of DNS: A Short History and a Short Future. He explains that "just as certain telecom-underserved areas are now installing pure digital infrastructures while heavily developed urban areas face complex digital-analog integration problems, phone-saturated urban areas such as New York were among the last to complete the conversion to ANC." Remnants of the old numbering system are still here, in the form of storefronts in many neighborhoods. 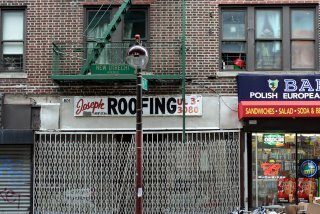 From the dates that this numbering system were used, we can surmise that these storefronts date to between 1930 and 1961. Here are some I've found in Borough Park, Kensington, and Midwood. 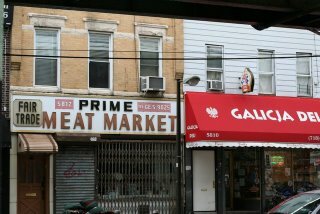 Although the sign says Prime Meat Market, this store is now G & N Meat MKT Incorporated. The building was built in 1931. The GE may have stood for either GEneral or GEneva, according to AT&T's list of recommended names for dialable/quotable telephone EXchange names. I didn't have any luck finding likely streets in the neighborhood that the exchange may have been named after, since most of the streets are numbered (ie, 14th Ave, 56th St). 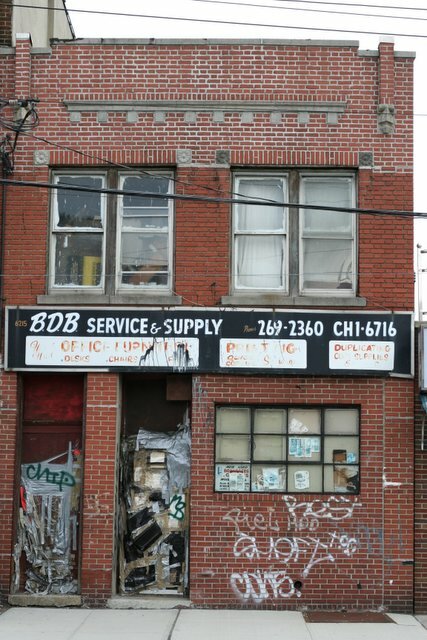 Built in 1931, this office furniture store is BOB Service & Supply. The CH probably stands for Church Avenue, which runs diagonally through Brooklyn and becomes 14th Avenue shortly after crossing McDonald Avenue. Another possibility is Chester Ave, which is a short street running between McDonald Ave and 36th Street. 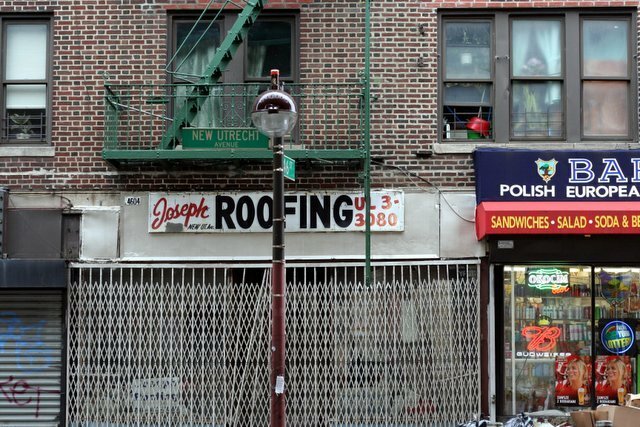 Joseph Roofing, 4604 New Utrecht Ave, between 46th & 47th Sts. This whole block was built as a unit in 1922. UL may stand for ULrick, ULster, or ULysses. 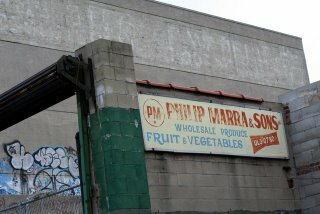 Philip Marra & Sons, Wholesale Produce, Fruits & Vegetables, at 2419 E Fourth St (on McDonald Ave). This store has been owned by the Pietro family for a long time - perhaps as long as the building has existed, which was built in 1933. 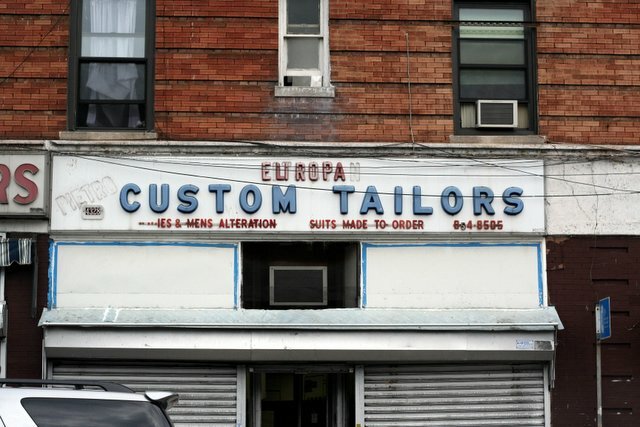 Now known as Scollo Pietro Italian Custom Tailor, you can see where the letters spelling out Pietro have fallen off, leaving only Europea[n] Custom Tailors. Similarly, you can see where the two letters in the phone number were taken down and replaced with the numbers 8 and 5. On the east side of McDonald Ave between Foster & Parkville Aves. 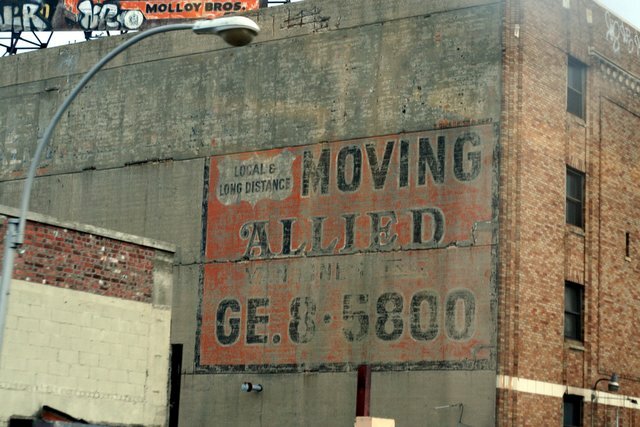 This was a sign for Molloy Bros. Moving & Storage (see billboard in the top left corner of the photo), a business which is still in operation, although not at this location. This sign is visible from the F train. GE might have stood for GEneral or GEneva. Kevin over at Forgotten NY has a photo of Molloy's Lounge at 5th Avenue and 62nd Street in Sunset Park. Probably no relationship but who knows. GCS Transmissions, 1227 McDonald Ave @ Ave. J. This sign is visible from the F train. CL may have stood for Clara Street, which runs between McDonald Ave and 36th Street. 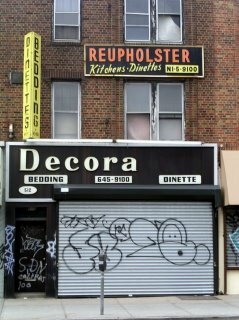 Decorative Dinette Bedding Incorporated, 512 Kings Hwy @ E. 2nd St., Midwood. This building was built in 1929. Presumably the Decora sign used to say Decorative. The NI may have stood for Niagara. Hi. I'm really into the vintage scene and was wondering if you found any information regarding phone exchanges. I'm trying to find out what mine may have been, I live in Brooklyn but not near where you have found most of the numbers. Thanks for any help you could give me. Wow, this sure brings back memories. I lived on New Utrecht Ave. between 57 & 58 St. for 20 years starting in the early 1950s. The name of the GE exchange was Gedney and the UL was Ulster. Update -- GE was GEttysburg; CH might have been CHickering; I'm still stymied by UL; CL was CLoverdale; and NI was NIghtingale. GE Brooklyn telephone exchange definately stood for Gedney-as it was labeled on my old phone in the 1940's. This is fun going through the exchange names. I wonder what the name was or 33 (as in 332). This neon sign is in the window of The Wine Place at 2406 Broadway. I was born in 66' and I still remember my old number, it was ST8-XXXX. We lived in SunseT Park. My Grandparents were Ida and William (Wolf) Fleisher. Their sons were Joseph and Jacob, born in about 1914 and 1916, respectively. William and Ida had a Kosher Butcher shop on the south side of 18th Ave, a bit west of Ocean Parkway but not quite to the subway station (on Macdonald?) Their telephone number was GEdney6-5820. The butcher shop was on the ground floor, and just to the right was the door that led up the stairs to their apartment. Even while he continued his profession in Brooklyn, he bought an old country hotel in the Catskills near Woodburne in the mid 1950's, but couldn't make a go of that. Does anyone remember any of this? 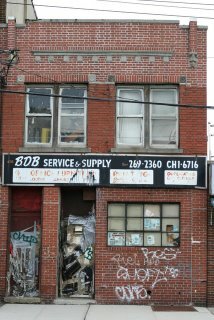 I am wondering if the old storefront is still there and if anyone could help me pinpoint address of the shop. 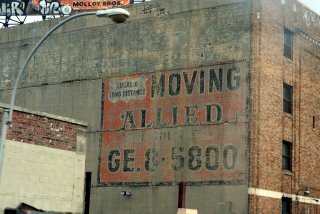 Please update this info- GE stands for Gedney in Brooklyn, period! 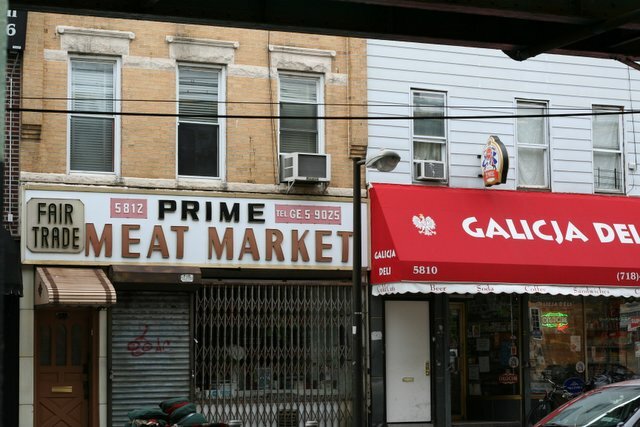 Your grandparents butcher shop was at 4025 18th Avenue. The telephone number was WIndsor6-5820.